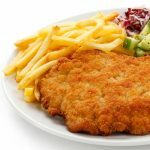 Schnitzel is the quintessential German dish. Every tourist to Germany has had Schnitzel and most fall in love with it. Some people associate Schnitzel with Wienerschnitzel. 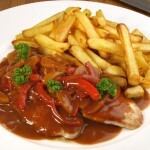 “Wienerschnitzel” is actually a geographically protected term in Germany and Austria and can only be made with veal. 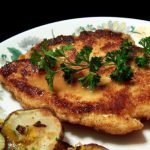 This traditional German Schnitzel is prepared the same way as Austrian Wiener Schnitzel. 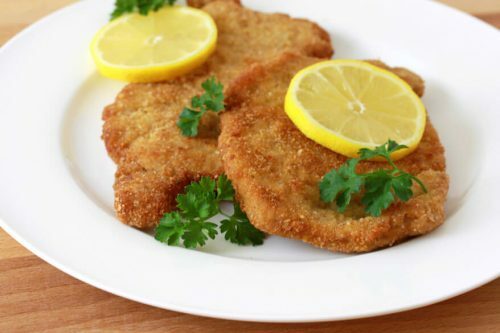 The only difference – German Schnitzel is made with pork instead of veal. 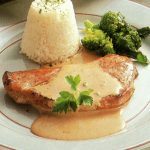 Place the pork chops between two sheets of plastic wrap and pound them until just ¼ inch (6 mm) thick with the flat side of a meat mallet. Lightly season both sides with salt and freshly ground black pepper. Place the flour mixture, egg, and breadcrumbs in 3 separate shallow bowls. Dip the chops in the flour, the egg, and the breadcrumbs, coating both sides and all edges at each stage. Be careful not to press the breadcrumbs into the meat. Gently shake off the excess crumbs. 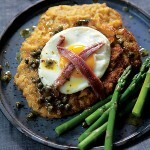 Don’t let the schnitzel sit in the coating or they will not be as crispy once fried – fry immediately. Make sure the cooking oil is hot enough at this point as you don’t want the Schnitzel to sit around in the coating before frying. Use enough oil so that the Schnitzels “swim” in it. Fry the Schnitzel for about 2-3 minutes on both sides until a deep golden brown. Transfer briefly to a plate lined with paper towels. 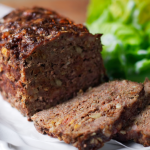 Serve immediately with slices of fresh lemon and parsley sprigs or with your choice of sauce. Serve with German Spaetzle, French fries, or German potato salad, and with a fresh leafy green salad.